Darla Miles reports from Elmhurst. ELMHURST, Queens (WABC) -- More than 200 firefighters responded to a five-alarm building fire in Elmhurst, Queens, on Tuesday night. The fire broke out around 6:30 p.m. between the roof and ceiling of the seven-story building on 94th Street. 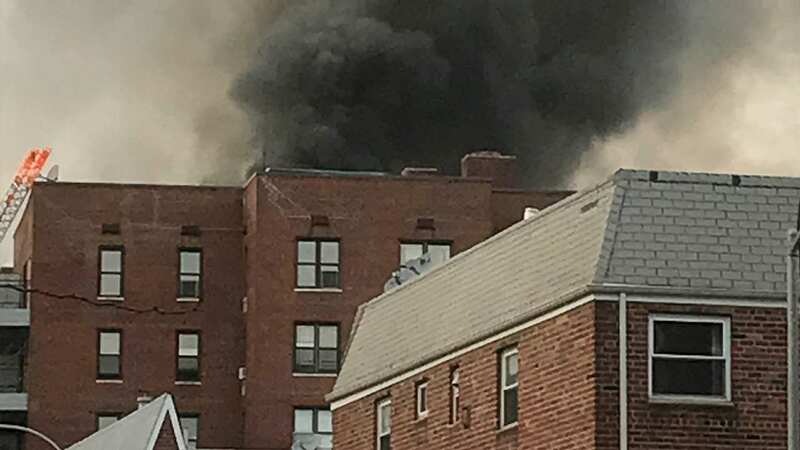 "I came from work and my neighbor knocked at my door and said that there was smoke in the building, and I walk outside and I see a lot of smoke coming out," said Dan Vixamar, resident. "That's when I decided to grab the most important things that I have and exit the building." "At that time that they arrived we saw the fire, but it was nothing like this going on now," said Jacquelyn Monica, eyewitness. The FDNY used a drone in their efforts to tackle the rooftop fire. They say all 10 apartments on the sixth floor were completely consumed by the fire. That's the same flood that Vixamar and Audrey Claussen live on. "Somebody broke down my door and got my dog for me," Claussen said. "When I bang at the door I hear no answer and I left, but when I called her on the phone she said the dog is in there. I went back, but the fire department people wouldn't let me back in the apartment," Vixamar said. Mobley wasn't the only one reunited with their pet parents. "We didn't know if everything was OK, and all of a sudden they said the dogs are here," said Ken Taylor, resident. In terms of injuries, there were only 11 minor, all to members of the FDNY. "The tragedy here though is extensive damage to 112 apartments," said James Leonard, FDNY Chief of Department. The Red Cross set up a reception center for affected residents at PS 13 on 94th Street in Flushing. On Wednesday, 112 units remain vacated. The Red Cross has registered 67 families; 15 of those families needed emergency housing.